Since we ALWAYS squeeze juice over the chicken once they’re done, adding juice straight into the egg wash is just as good. 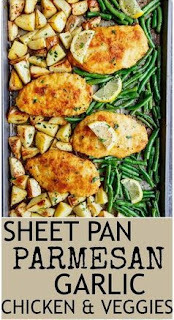 Potatoes and green beans drizzled in garlic butter complete the meal… all baked on the same pan! 0 Response to "Crispy Sheet Pan Lemon Parmesan Garlic Chicken And Veggies"